Joint Functional Component Command for Space, in coordination with U.S. Strategic Command other combatant commands, services and appropriate U.S. government agencies, concluded Exercise GLOBAL THUNDER 16 last November. 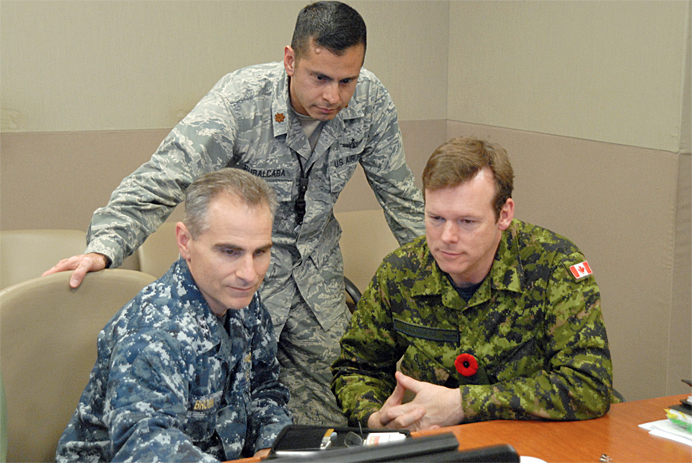 U.S. Navy Rear Adm. Brian Brown (seated left), Joint Functional Component Command for Space (JFCC Space) deputy commander, Royal Canadian Air Force (RCAF) Brig. Gen. Michel Lalumiere (seated right), RCAF Director General Space, and U.S. Air Force Maj. Daniel Rubalcaba, Rear Adm. Brown’s executive officer, prepare for a battle update and assessment briefing at the Joint Space Operations Center, Vandenberg Air Force Base, California, in support of Exercise GLOBAL THUNDER 16. Allied participation in the exercise strengthens relationships with our international partners and provides additional levels of resiliency in our combined forces. GLOBAL THUNDER is an annual U.S. Strategic Command training event that assesses command and control functionality in all USSTRATCOM mission areas and affords component commands a venue to evaluate their joint operational readiness. Planning for GLOBAL THUNDER 16 has been under way for more than a year and is based on a notional scenario with fictitious adversaries. One of nine DoD unified combatant commands, USSTRATCOM has global strategic missions, assigned through the Unified Command Plan, which include strategic deterrence; space operations; cyberspace operations; joint electronic warfare; global strike; missile defense; intelligence, surveillance and reconnaissance; combating weapons of mass destruction; and analysis and targeting. U.S. Air Force photo by Capt. Nicholas Mercurio. GLOBAL THUNDER is an annual command and control exercise designed to train Department of Defense forces, assess joint operational readiness and validate the command’s ability to identify and mitigate attacks across all of USSTRATCOM’s mission areas, with a specific focus on space, cyber, missile defense, and nuclear readiness. “I am extremely proud of the team; the mindset they displayed and how they responded to a myriad of challenges which tested the limits of our ability to command and control in a contested, degraded and operationally-limited domain was simply outstanding,” said Lt. Gen. David Buck, commander, 14th Air Force (Air Forces Strategic) and JFCC Space. Moog Inc. Space and Defense Group recently won a technology development contract under the Booster Propulsion Technology Maturation Broad Agency Announcement from the US Air Force. Moog will focus its efforts on additive manufacturing of parts for liquid fueled first stage rocket engines. Moog will explore the material properties unique to additive manufacturing and discover the fault tendencies of the materials using in-house additive manufacturing technologies and failure analysis techniques. Moog will improve the additive manufacturing processes to avoid those faults in the production phase. The Moog facility in East Aurora opened a titanium and stainless steel additive manufacturing center in 2014. Work on this contract will take place in the East Aurora facility which is co-located to the launch vehicle fluid controls engineers at Moog. Moog sees the impact of additive manufacturing in many business areas. Moog recently acquired 70 percent ownership in Linear Mold and Engineering based in Livonia, Michigan. This company specializes in metal additive manufacturing. The Air Force awarded this contract to improve the U.S. industrial base capabilities for next generation launch vehicle booster engines. The US is committed to ending its reliance on foreign first stage rocket engines to launch strategic U.S. assets into space. Moog is proud to be a part of next generation U.S. space launch assets continuing a rich history of supporting every major U.S. space launch system over the past 60 years. DoD Obtains RF Interference Monitoring + More From Kratos’ SAT Corp.
Kratos Defense & Security Solutions, Inc. announces their SAT Corporation subsidiary will provide expanded end-to-end satellite RF monitoring, interference detection, geolocation and mitigation services to the Joint Functional Component Command for Space (JFCC Space). A component of the U.S. Strategic Command (USSTRATCOM), JFCC Space is responsible for executing continuous, integrated space operations to deliver theater and global effects in support of national and combatant commander objectives. This includes protecting the commercial satellite bandwidth leased by the U.S. Department of Defense (DoD) to support a variety of critical mission needs such as reconnaissance, surveillance and broadband communications between commanders and field units. Air Force Space Command (AFSPC), as USSTRATCOM’s service component, has renewed investment in Space Situational Awareness activities and protecting the overall space environment. Additionally, new initiatives such as the Joint Interagency Combined Space Operations Center (JICSpOC) and the Commercial Integration Cell (CIC) have focused on a robust government and commercial partnership. Kratos’ Spectral Services team is an integral part of implementing this collaborative effort in addressing the contested and congested RF Environment. Kratos has been tasked with end-to-end protection of the commercially-leased bandwidth for U.S. Central Command (CENTCOM) and U.S. Pacific Command (PACOM). Kratos will continue to leverage their multi-million dollar investment of strategically positioned sensors to expand the range of services they have been providing to JFCC Space. 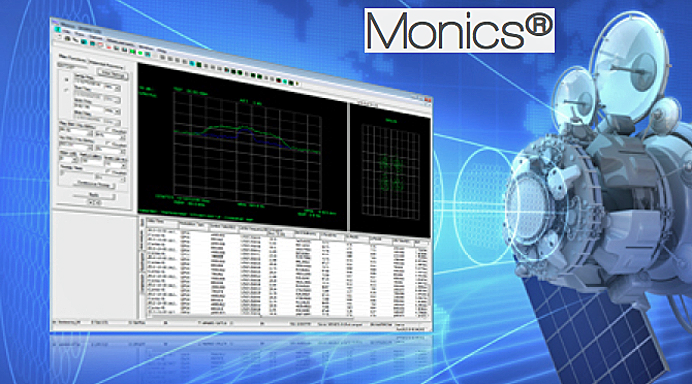 Kratos’ Monics® sensor infrastructure covers a majority of the fixed satellite service beams and uses state-of-the-art technology to take high-speed, accurate measurements of critical satellite systems. Kratos’ globally deployed monitoring and geolocation assets will detect and locate the source of any intentional or unintentional interference. Kratos, in partnership with JFCC Space’s Joint Space Operations Center (JSpOC) and Army Strategic Command (ARSTRAT) will work to resolve interference events that impact critical DoD missions. This award represents an expansion of an existing services contract to support more comprehensive coverage and improve collaboration. 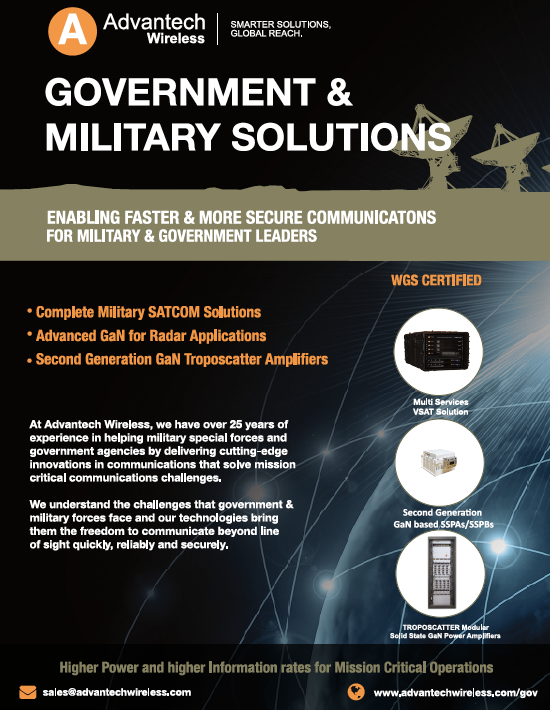 “As military communications increasingly rely on commercial payloads, newer, lower cost methods of providing resiliency to interference are fostering the convergence of DoD and commercial protected communications applications,” said Phil Carrai, President of Kratos’ Technology and Training Solutions Division. Northrop Grumman Corporation has been awarded an order to support embedded Global Positioning System (GPS)/Inertial Navigation System (INS) Pre-Phase 1 modernization efforts. Under the cost-plus-fixed-fee order valued at $4.8 million from the Joint Service Systems Management Office, Northrop Grumman will evaluate new GPS receivers’ modes of performance, including M-Code and Selective Availability Anti-spoofing Module. Out by January 2020. ADS-B Out transmits information about an aircraft’s altitude, speed and location to ground stations and to other equipped aircraft in the vicinity. The modernized system is expected to be available for platform integration starting in 2018. Harris Corporation marks its 120-year anniversary by recognizing its heritage of transformation and innovation. Founded in the back room of an Ohio jewelry store in December 1895, Harris grew from a tiny printing press company into a top 10 defense contractor with $8 billion in annualized sales, 22,000 employees, customers in 125 countries, and a diverse portfolio of technologies that connect, inform and protect the world. Harris is the longest-thriving major defense contractor and one of 398 publicly held companies still in existence for 120 years or longer—including GE, CVS, Coca-Cola, Pfizer, P&G, and J.P. Morgan. (120+ Companies). Harris has also introduced a long list of notable technology innovations, including the world’s first automatic and four-color printing presses, the Washington-Moscow hotline, GPS navigation space antennas, multi-band military radios, and advanced air traffic management and weather forecasting solutions. Harris today is an industry leader in technologies for defense, space, weather, air traffic management and electronic warfare. Air Force Space Command’s Space and Missile Systems Center announced the completion of two major milestones in the development and fielding of its new Space-based Infrared System ground system. The Full Constellation test event was conducted from the MCS at Buckley Air Force Base, Aurora, Colorado by 460th Operations Group personnel. Leveraging lessons learned from previous SBIRS ground upgrades, the Block 10 plan has successfully implemented a “crawl, walk, run” approach as it has incrementally demonstrated the functionality of the new integrated command and control for the DSP, GEO and HEO constellations. The completion of the CE phase marks the readiness of the Block 10 upgrade to proceed out of the development phase and into formal test activities. It also verified the Block 10 system’s performance against requirements and demonstrated the ground system’s readiness for operational use. The SBIRS program is managed by the Remote Sensing Systems Directorate at the U.S. Air Force Space and Missile Systems Center, Los Angeles AFB, El Segundo, California. Lockheed Martin Space Systems Company, Sunnyvale, California is the SBIRS prime contractor, and Northrop Grumman Electronic Systems, Azusa, California, is the payload integrator. The 460th Space Wing at Buckley AFB, operates the SBIRS system. 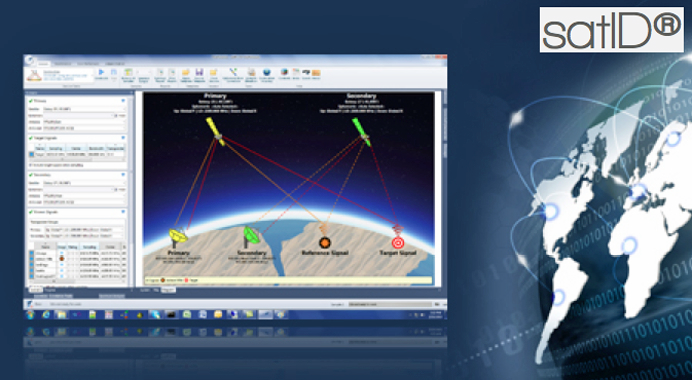 The SBIRS program delivers timely, reliable and accurate missile warning and infrared surveillance information to the president of the United States, the secretary of defense, combatant commanders, the intelligence community and other key decision makers. The system enhances global missile launch detection capability, supports the nation’s ballistic missile defense system, expands the country’s technical intelligence gathering capacity and bolsters situational awareness for warfighters on the battlefield. 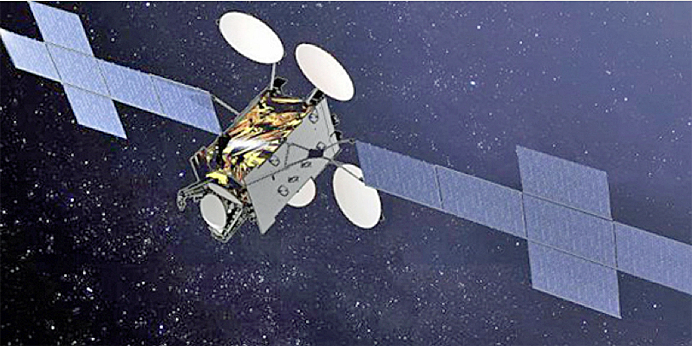 Airbus Defence and Space has been awarded the contract by the French defence procurement agency (DGA) for one of two military satellites for the COMSAT NG secure telecommunications program. 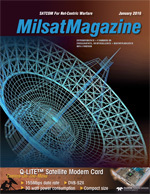 Airbus Defence and Space will also be co-responsible, together with Thales Alenia Space (lead contractor), for the entire space program, which includes two satellites, their launch, the ground control segment, Ka-band anchor stations, options for additional satellites, as well as the studies and operational maintenance of the system. Designed to replace the Syracuse III system, COMSAT NG is scheduled to go into operation from 2021 and will provide high-throughput capacity in the military Ka-band in addition to those in the Syracuse III X band. COMSAT NG has an expected service life of 17 years. The satellite to be produced by Airbus Defence and Space will be based on the electric version of the ultra-reliable Eurostar E3000 platform. This version is the bestselling electric propulsion telecommunications satellite on account of its lighter service module, improved mission performance and lower operating costs. Aside from its role as the prime contractor for one of the two satellites, Airbus Defence and Space will also be responsible for an essential part of the two satellites’ payload.